"Tomato slices, spring greens, and cooked bacon are layered on a sheet of fresh mozzarella. 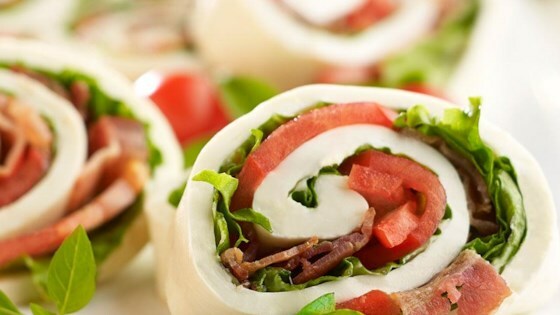 Roll it up and slice it, and you've got BLT pinwheels!" Unroll BelGioioso Unwrap & Roll(R). Layer lettuce, tomato and bacon onto sheet. Roll and slice into pinwheels for a hearty and delicious appetizer.